Maharashtra Public Service Commission (MPSC) has released the notification for the mains exam of Maharashtra Forest Service Main Exam 2018. As per the Notification Number 21/2018 on date 24 June 2018 MPSC conducted Maharashtra Van Seva Surksha Preliminary Exam - 2018. The result was declared by the MPSC on 7 September 2018. Those candidates who have cleared the preliminary examination can now apply for the Mains Examination. Maharashtra Van Seva Mains exam will conduct in Mumbai on 27 October 2018. The total number of vacancies are 69 which are divided into Assistant Forest Guard 16 and Forestry an 53. Only candidates who passed in the prelimanary exam can apply for this posts and have to fill the application till 26 September 2018. 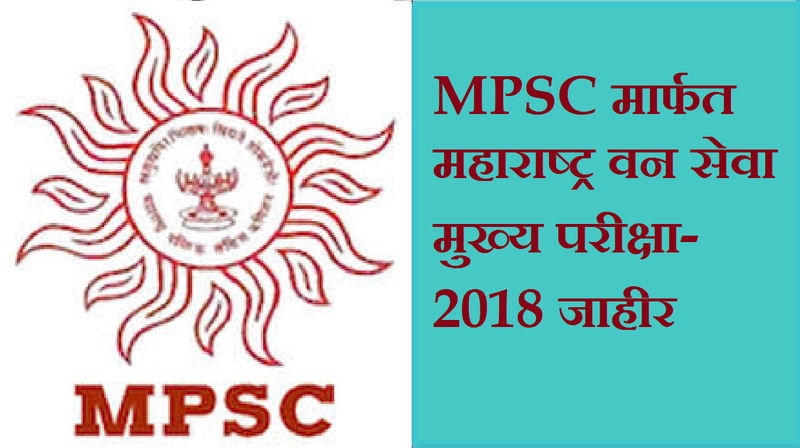 MPSC Recruitment 2018, The online submission of application started from 12 September 2018 and last day to apply is 26 September 2018. न्यूनतम: 18 साल, अधिकतम: 38 वर्ष, यानी एक उम्मीदवार का जन्म 02.08.1980 से पहले नहीं हुआ होणा चाहिये और 01.08.2000 से अधिक नहीं (दोनों तिथियां सम्मिलित). ऊपरी आयु सीमा अनुसूचित जाति / अनुसूचित जनजाति 5 साल, अन्य पिछड़ा वर्ग 3 साल, विकलांगों को 10 साल, पूर्व सैनिक को 5 साल. न्यूनतम: 21 साल, अधिकतम: 38 वर्ष, यानी एक उम्मीदवार का जन्म 02.08.1980 से पहले नहीं हुआ होणा चाहिये और 01.08.1997 से अधिक नहीं (दोनों तिथियां सम्मिलित). ऊपरी आयु सीमा अनुसूचित जाति / अनुसूचित जनजाति 5 साल, अन्य पिछड़ा वर्ग 3 साल, विकलांगों को 10 साल, पूर्व सैनिक को 5 साल. 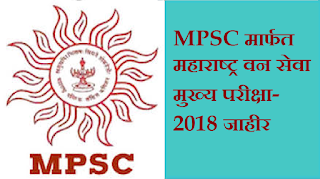 MPSC Recruitment 2018 Exam Pattern. The examination will conduct in two-phase in the first phase there will be written exam which is of 400 marks and in the second phase, there will be Interview of 50 Marks. Candidates have to apply online their is no other mode to fill the form. Candidates have to submit their application on MPSC official web portal. After filling the application form candidates have to pay the fees and submit the form. The last date to submit the online application is 26 Sept 2018.